For the first part of Kiki the bulldogs life, she was confined to a small metal crate. Her surroundings included nothing more than a dark, cold garage. Seriously ill and almost out of hope, she held on just long enough to be rescued. But, that was just the beginning of Kiki's long, painful road to recovery. When founder of Southern California Bulldog Rescue, Skip Van Der Marliere, took Kiki in about two months ago, she was in extremely rough shape. In those two months alone, Skip had to rush Kiki to the vet numerous times – once after she woke up her own waste and could hardly stand. Skip thought that was the end for Kiki, but she had other plans. Kiki pulled through. Kiki’s previous owners surrendered her in May. She was in horrific shape. Kiki suffered from large infected bed sores and was severely malnourished and thin. She also suffered from two types of untreated, serious autoimmune diseases - one that affected her infected and raw skin as well as one that affected her bowels. Kiki’s rescuers believe she was kept in a small crate in a garage for the majority of her early life that, among her other ailments, left her with scoliosis. But in spite of Kiki’s horrendous condition, she was still able to walk – though painfully due to the blistering sores on the bottom of her paws – and was still interested in what was going on around her. She also adored human contact. (BarkPost). Skip will not give up on Kiki. He has been fighting to keep Kiki alive but it has not always been easy. Despite all the trips to the vet, Kiki is still in pretty rough shape. Her conditions feed on each other, making it difficult for any treatment plan to stick. Until her bowel issues are under control, Kiki is unable to do any stem cell treatments or take steroids that could help her skin issues. Skip has been trying to help Kiki gain weight using “novel meats” she might enjoy such as duck or rabbit. Kiki also receives medicated baths for her skin using gentle scrubbings with makeup or tooth brushes. She doesn’t always like the baths but she loves the human attention – something she likely didn't receive before. 󾇛KIKI UPDATE!󾇛 Rub a dub-dub.. Kiki in the tub! She is such a sweetie and so patient with us when give her her bath a couple times during the week. The weekend one usually takes the most time since we're able to really kind of concentrate on the areas that have more scabs that continue to grow back. Her ears are a particularly tougher area on her. Sh's still eating very well and we're hoping she gains enough weight so we can try stem cell on her soon. In the meantime we just maintain her and keep the scabs under control and watch her baby fur starting to grow in patches. She looks like she's going to be a red colored bulldog with a beautiful white streak across the top of her head and maybe on her paws too. Though Kiki has a long road to recovery, there have been small victories that give Skip - and everyone rooting for Kiki - hope. She is slowly starting to grow fur back – starting in her right front paw. And, Kiki recently tried to get up on the couch! She didn’t make it but it made Skip ecstatic – especially since it meant Kiki is starting to show interest in things, something she didn’t do before. 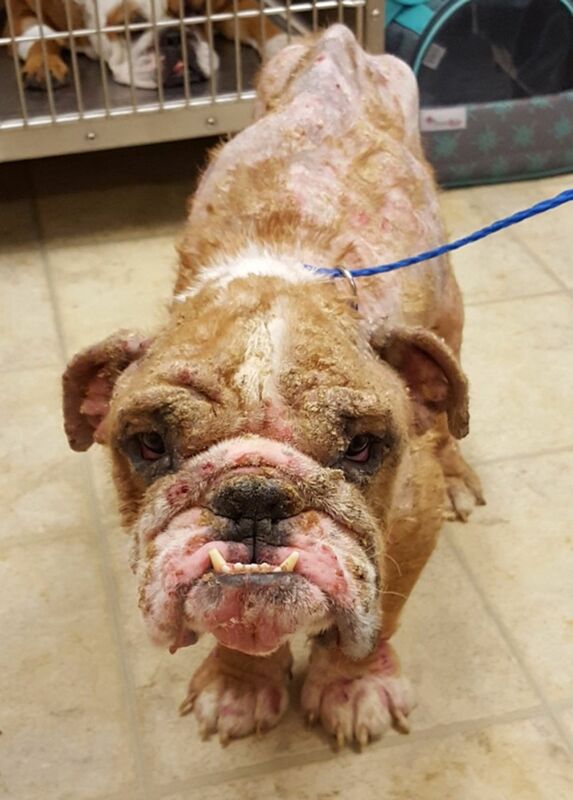 About a week ago, Southern California Bulldog Rescue posted an update on Kiki on their Facebook page. They said Kiki has gained 30 pounds since she has been with them, she is now on a pancreatic enzyme that is added to her food to help with her bowel issues, and she is eating more! They even posted a picture of her progress. (Facebook). Though Kiki spent the first part of her life in appalling conditions and with no human attention or love, she now has people who will not give up on her. Kiki’s perseverance and strength show in her progress - both physical and emotional - and her will to live. She may still have a long way to go, but if the past few months are any indication, she’ll get there.